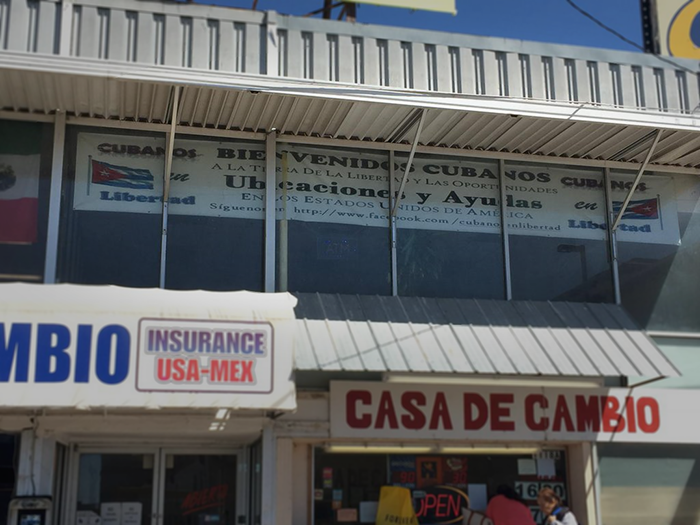 "Welcome Cubans to the Land of Liberty and Opportunity"
Over the last couple of months thousands of Cuban migrants have been transferred from Costa Rica to Nuevo Laredo, Mexico, from where they cross into Laredo, Texas. As the islanders leave the port of entry at Bridge 1 they are greeted by a banner immediately across the street, which reads "Welcome Cubans To The Land of Liberty and Opportunity." The welcoming banner hangs from the offices of the non-profit organization Cubanos en Libertad (Cubans in Liberty). My colleague Jessica Vaughan and I were able to meet the man behind the organization during a recent visit to Laredo. Alejandro Ruiz founded the group in 2014. Ruiz explained that he started the non-profit after he traveled through Laredo for business and became aware of the large number of Cubans coming in through Bridge 1. As a Cuban immigrant himself, who arrived in the United States in 1992, Ruiz explained that he wanted to help others as he was helped decades earlier. As such, Ruiz helps Cuban migrants get access to benefits granted to them by the Cuban Adjustment Act of 1966. (They are given legal status despite lacking visas – the "wet-foot/dry-foot" policy – and receive full access to welfare programs.) Ruiz explained that he takes Cuban migrants to the Health and Human Services offices to get access to TANF (cash welfare), SNAP (food stamps), and Medicaid. During our visit he also showed us two envelopes with Social Security cards ready to be picked up by newly arrived islanders. Additionally, Ruiz gave us a checklist that he gives the migrants, which notes all the documents they need to have in order to acquire a work permit. While the Cubans wait for all their benefits to be in order, Ruiz provides them a place to stay. According to Ruiz, all of these services are free of charge and the non-profit is funded by his own money. Ruiz estimated he received 40 to 60 Cubans per day over the last year, and on some weekends he would receive between 100 to 200 islanders. He speculates that about 20 Cubans have stayed in Laredo over the last year. The rest of the islanders leave Laredo either immediately or after a couple of months. According to Ruiz about 70 percent of the migrants go to Florida, 25 percent to Houston, and the other 5 percent are going to Los Angeles, New Jersey, South Carolina, Kansas, Nebraska, and Kentucky. Moreover, Ruiz asserts that the number of Cubans coming to the United States will not decrease any time soon. By talking to Cubans when they arrive and talking to people over the internet, Ruiz estimates that there are over 30,000 Cubans already in Central and South America headed for the United States: 20,000 in Ecuador, 2,500 in Panama, 3,000-5,000 in Colombia, and 2,000 in Brazil.